Just to shake things up a bit...for the first time ever Chris is going to write this post! He spent more time in Finland than me and he was kind of more part of the action than I was too, so it seems appropriate he is the author of this O geek post. 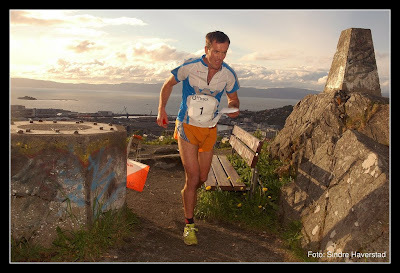 Not really related to this post, but it is a pretty photo of Chris orienteering during the Trondheim sprint cup final. What wonderful weather we had on Saturday! That, coupled with the fact it was a three day weekend meant it was definitely time for another adventure. Chris and Em up to no good in the mountains again! The university O club here (NTNUI) had organised an orienteering training event over near the Selbusjoen lake at 7 pm on Saturday evening, so we planned to bike out to the event with our gear to head into the hills following the event. After a pleasant 1.15 ride out to the meeting point we assembled for the girls' and boys' mass starts. Off into some depressiony kind of terrain, myself along with several much more reputable orienteering others (not to name any names (-:) spent 13 minutes on the hunt for control no. 1. After several more controls working out in a alarmingly similar manner my 'orienteering patience' was dwindling - not aided by the fact I was being eaten alive by mosquitoes every time I stopped to look at the map!